For integrating a webphone into your Facebook account, Ozeki VoIP SIP SDK offers a remarkable solution. This solution allows to make Facebook to SIP calls using Flash webphone technology. Learn more in this article and download the sample program to start development quickly. Facebook is the most popular social network on the Internet with its thousands users. It has its own rule system that allows anybody to define and embed their own applications into their profile site. When you want to use your Flash webphone solution to be put on your Facebook profile, you only need to set some basic things for that and anybody who visits your profile can call your softphone through the embedded Flash webphone (Figure 1). For creating a Facebook application, you need to visit the Facebook developer's site (https://developers.facebook.com/). 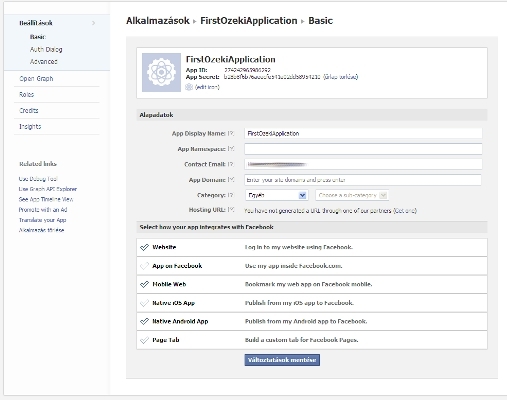 This site shows you the basics about Facebook application creation. First of all you need to have a Facebook account that you need to validate by giving your cell phone number or visa card number. This allows the Facebook team to know who made the certain applications. This is a security step for getting to know about virus writers. You can create a new Facebook application by using the sample program you can download from this page. It is a Flash webphone for SIP calls. You need to set the server-side application on a public domain and need to specify the server IP in the client application. You also need to place the client-side program somewhere to be reached from your Facebook application. In this example case you need to define a Canvas application in your Facebook profile. First go to the developer site and press the Create New App button (Figure 2). You can give a name to your application or even (optionally) define a namespace. You can also ask for a free web hosting service if you want. You can use it for your server application and storing your client scripts (Figure 3). After giving a name to the application, you need to pass a security check too. This is for securing that you are a human programmer not a virus. If you did not validate your account yet, here you can do it. You cannot make Facebook applications without account validation. You can see and modify the basic settings for your application after creating it on a form shown in Figure 4. In this sample application you need to choose App on Facebook choice and set the Canvas URL to your site. You can also edit the icon image for your application on this page. You can specify the size of your canvas on the Advanced tab (Figure 5). You can set to an absolute value or make your application be resizable. When you are ready, you can create the Facebook page for your application by pressing the button on the bottom of the page. Facebook asks developers creating Adobe Flash based apps within Canvas to set the wmode of the Flash object to "opaque". From this point your work is very easy. You specify the location of your application, make sure that your webphone server runs and the client has the proper server host information set and anybody who installs your webphone application can call you with the phone number you have given them.